Brighten your holidays with this attractive Tea Ring. 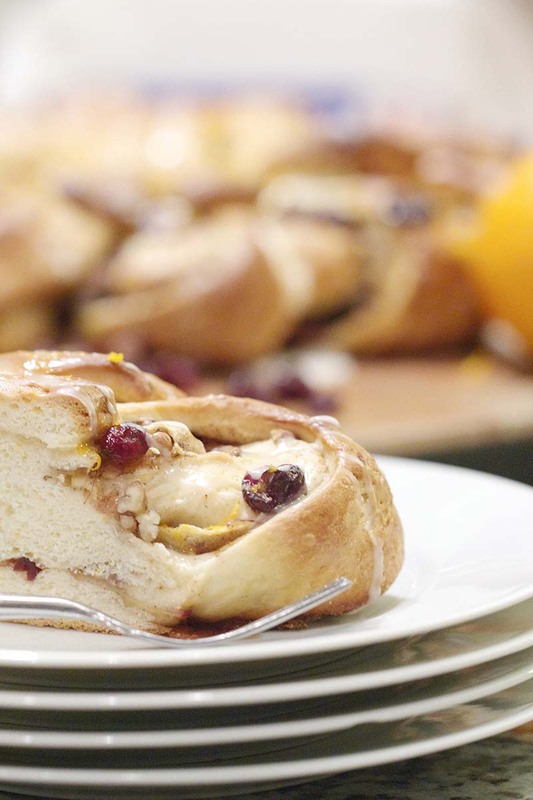 The delicately flavored orange bread overflows with a delicious filling of cranberries and apples. Drizzled with an orange glaze, this decorative ring makes a mouthwatering centerpiece for your holiday table. Blend 1 cup flour with salt, sugar, grated orange peel and yeast; set aside. Heat milk, water, and butter until warm (120-130°F, butter does not need to melt); pour into large bowl. Add flour mixture. Blend on low 30 seconds; add egg. Beat on medium 3 minutes. Stir in remaining flour. Knead on floured surface 5 to 8 minutes until smooth and elastic. Place dough in oiled bowl; turn to grease. Cover; let rise until dough tests ripe, about 1-1½ hours. Punch down dough on lightly floured surface. Roll into 15-x12-inch rectangle. Blend egg white and water; brush over dough. Refrigerate remaining egg white. Filling: Combine sugar and cinnamon; sprinkle over dough. Top with apples, cranberries and nuts. Starting with long side of dough, roll into log; pinch to seal. Form into ring; overlap and seal ends. Place seam-side down on greased baking sheet. Using scissors, cut ring from outside through all dough layers to within 1-inch of center. Make 12 cuts, about 1-inch apart. Twist each cut section ¾-turn so cut side faces downward forming pinwheel. Cover with damp cloth and let rise in warm place until indentation remains after touching side, 30 minutes. Brush with remaining egg white. Bake in preheated 375°F oven 30 to 40 minutes until golden brown; cool. Icing: Blend powdered sugar, orange juice and peel. Drizzle over cooled tea ring.